There are over 40 million fingerprints in the United States Integrated Automated Fingerprint Identification System. 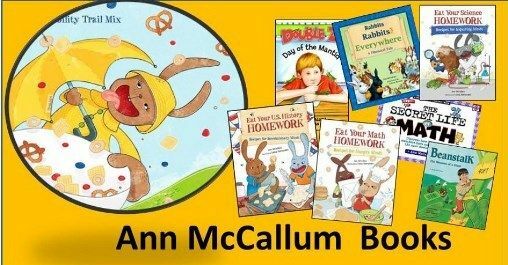 That interesting fact and many more about fingerprints are shared in the Loop, Whirl, and Arch Cookies lesson in Ann McCallum's Books Eat Your Science Homework Recipes For Inquiring Minds book. Written by Ann McCallum and illustrated by Leeza Hernandez, this book is about much more than just fingerprints. I read "upper elementary" in one sales description. I think it fits my 6th grade son's interest level just right. The illustrations are colorful and engaging. Cartoon animals (named after elements and famous scientists) are the chef/scientists on the pages. Recipes are shared that you can make with your children, and they learn much more than cooking as you create together. Veggie sticks and dressing lead to teaching your child the difference in miscible and immiscible liquids. Oxidation is explained with invisible ink on bread! Science and cooking are two things my son already enjoys, so combining them just compounded his enjoyment. Popcorn ball molecules give a whole new perspective to chemistry homework. Our crazy schedule lately means a little less time home in the kitchen, so we substituted bagged treats for the homemade ones in this chemistry lesson. 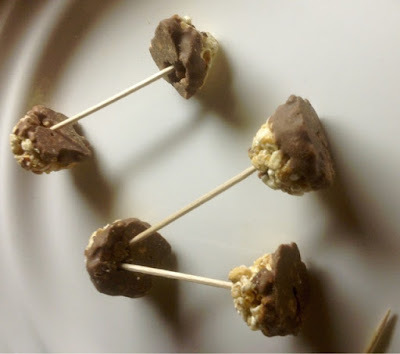 My son still wants to actually make the Atomic Popcorn Balls from the recipe in the book. These recipes are written for children, but my son still works beside me in the kitchen. 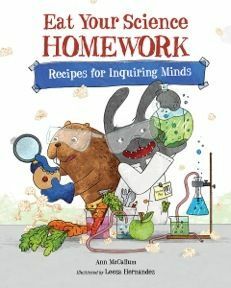 I hypothesize that if you work through these recipes with your kids, that their enjoyment of science will grow, too. Safety tips are included as well as a glossary, review section, and a beginner's guide to working through scientific reasoning. 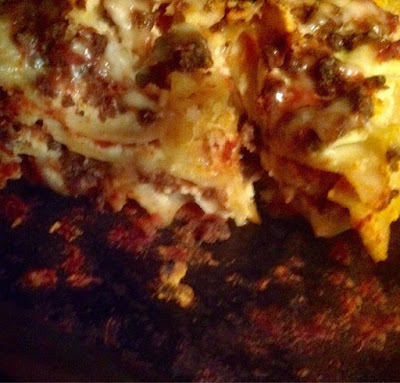 Do you see the individual layers in lasagna after it is baked? That is one of the observations Ann Macallum asks kids to make in the recipe lesson Sedimentary Pizza Lasagna. Minerals and rocks are discussed then the lesson expands to cover categories of rocks and Mohs scale of hardness. Each lasagna ingredient is evaluated to determine where it fits on that scale. Science homework has never been so much fun! 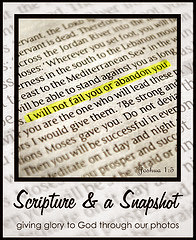 In addition to the book there is a helpful downloadable resource for teachers on the website. I saved the 21 page teacher guide to iBooks to easily access the discussion guide, charts, and additional games that are shared in the e-book. I love our autographed book, but the teacher's guide is my favorite part. It adds extra depth to each lesson. The solar system, geology, genetics, and much more are covered in these diverse lessons, but all have the common factor of food. Hands on practice is my personal favorite way to learn, and that makes it one of my favorite ways to teach, too. I'm ready to try all of the Eat Your Homework books. Click the graphic below to read more Schoolhouse Crew reviews, then check out these award winning books for yourself.